I know you are in a hurry but stop for a moment. 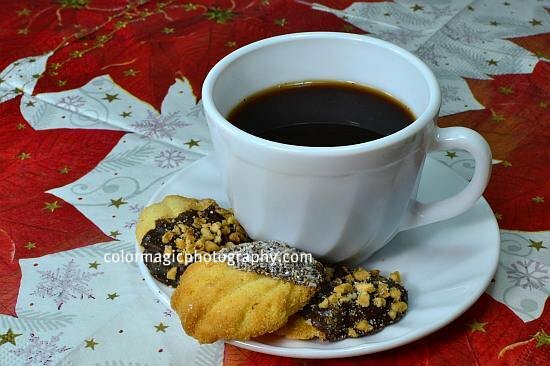 Take a brake and have a coffee and some cookies with me! Now we can talk about flowers. Remember, you can post anything you want to Macro Flowers Saturday in the holiday season. I have poinsettias not just on the napkin, I have a real one too. This is my new poinsettia flower, it's my first, ever. I have to learn jet how to care for it, though I don't think it is possible to induce to reflower the poinsettia after the initial display when purchased. Its a very interesting plant with all these leaves turning flaming red, though it feels a bit (a lot) like plastic. The flowers are in fact just the small yellow structures found in the center of each leaf bunch. 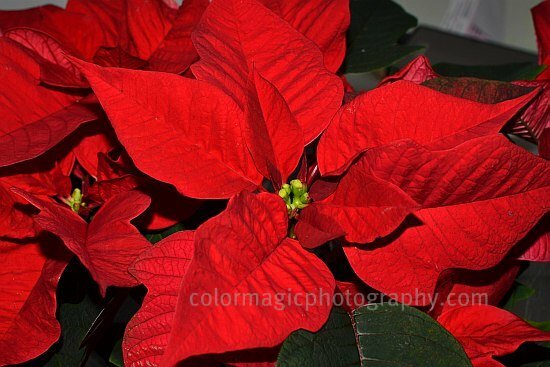 Poinsettias are lovely Christmas decoration. ... thanks for the cup of coffee and the time out. The Christmas Star is a perfect photo and so beautiful ..
And I had some cookies and coffee. Thanks Maia! This time of the year we all need to stop for a moment and enjoy the season. The poinsettias, both real and on the napkin, are lovely. Thanks for the coffee Maia. I love coffee and cookies. Thank you! In Borneo, we always associate poinsettias as Christmas flowers, and we drew them on our self made cards. My current landlord had chopped down what must have been a huge poinsettias tree, and the leaves are growing. I took photos of a very small flower. I must take the whole little bush for effect for next week's challenge. If I could, I'd fly over to have that cup of coffee and the cookies. Thanks Maia, you have given me the spirit of christmas...your page is so welcoming. I'll be right over! Yum! My husband is allergic to poinsettias (very unusual, but it happens) so only artificial ones for us. Yours are so pretty!